If you’re planning a luxury stay to do nothing but relax, here’s what we’d recommend. 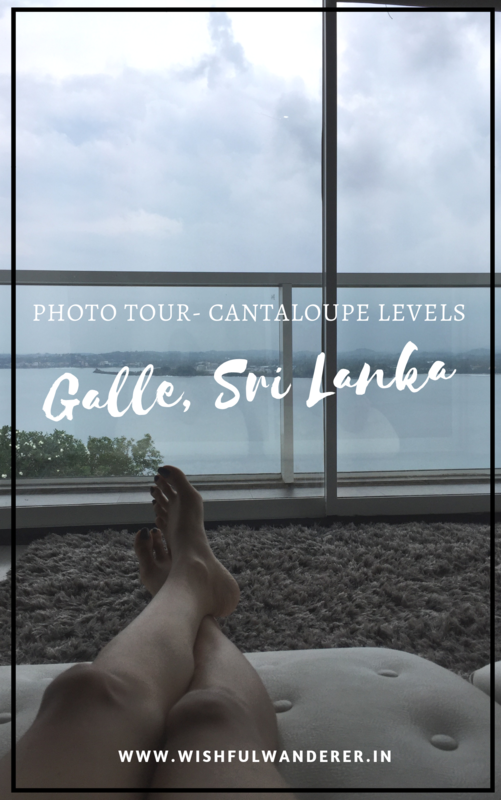 Book a flight to Colombo, drive down to Galle and check in at Cantaloupe Levels. What can you expect out of this resort, nothing but scenic views, a relaxed stay and rooms you wouldn’t want to step out of. Booking: You can book your rooms through their website or through http://www.booking.com. They take an advanced payment and so be completely sure before you make a booking. Travel: Cantaloupe Levels is located very close to Jungle Beach at Unawatuna and is almost a 3 hour drive from Colombo airport. It’s away from the hustle bustle of the city and travelling around can be a little tough. However, Tuk Tuks are available freely so you can rely on them to take you around. Resort: Cantaloupe Levels is a luxury boutique resort, they have just 9 beautiful rooms. The resort is on a hill top and opens up to a breath-taking panoramic view of the ocean that stretches to the horizon. You can catch the best of sunsets from here. They have an infinity pool with relaxing pool beds around and a restaurant that serves a good mix of local as well as continental fare. Rooms: We booked the Deluxe rooms at Cantaloupe Levels that opened up to the pool. The rooms were clean and comfortable, the mattresses however were quite uncomfortable and definitely need to be changed. Other than that, the rooms were spacious, the washrooms were huge with a private Jacuzzi inside. To our surprise, we were upgraded to the Suite, on the second level, which had a gorgeous view of the ocean with two day beds where you could lie down and watch the waves, the sun and the moon all day long. Rest of the room was pretty similar to the Deluxe. The Suite is definitely worth the price and we would definitely recommend it! Restaurant: The food at Cantaloupe Levels was great. Though they didn’t have a buffet for breakfast, which we’d prefer on a holiday (you know, all that excitement of starting your day with an elaborate buffet), they had a decent menu. The must try dishes on their menu were the Sri Lankan Biryani and the Fish Curry. Service: This was the only place where I see room for improvement. The service was slow, although friendly and polite. We had many instances where we had to call the room service 2 to 3 times for a particular request. Getting There: A prepaid cab ride from Colombo airport to Cantaloupe Levels will cost you somewhere around 8,000-9,000 Sri Lankan Rupees. Overall, if your idea of a holiday is a fancy resort where you can just sit back and relax, this place is a must visit. Posted in Galle, Sri Lanka, Weekend Getaway, Where To Stay, World TravelTagged award winning travel blogs, best indian travel bloggers, best indian travel blogs, best travel blogs, boutique resorts in sri lanka, cantaloupe levels, chandni tolani, featured, Galle, indian travel bloggers, international travel blogs, luxury resorts in sri lanka, Sri Lanka, sri lankan tourism, travel blogger, travel diaries, travel websites, traveler, travelers, unawatuna, where to stay in sri lanka, world travel, world travel blogsBookmark the permalink. It looks a wonderful place to stay, though the slacky room service worries me a bit because I would prefer to get prompt service for the kind of money we are paying. This looks like a wonderful place to relax and rejuvenate. Visiting Sri Lanka is on the cards. Will try to check it out! Wow! Cantaloupe Levels the way you have described and as seen in the photo gallery, definitely comes across as a place for a fancy deluxe stay when visiting Colombo in Sri Lanka. I love the elaborate buffet too for the breakfast but in the absence of the same, it allows you to check the menu and try out different things! Thanks for that tip! This is a very honest review, which I thoroughly appreciate. However, an uncomfortable mattress is a deal breaker for me, although I am a sucker for boutique hotels! Thanks for sharing! I’ve been wanting to visit Sri Lanka! Nice to see there are a variety of options to stay there. Thanks, I’ll definitely keep this in mind for my next trip! This looks like a real fun place. I am planning a Sri Lanka visit soon, I am hoping to add these tips from the blogs I am coming across recently. Sri Lanka looks like a great place to visit.. thank you so much for sharing all these info.. would love to visit sri lanka someday. This looks like a very nice place to wind down and relax for a while when we visit Sri Lanka. Will keep this in mind for our future planning! Thanks for your honest review, I’m traveling around Asia right now and considering visiting Sri Lanka, so your review will become handy! Thanks for this review! I am heading to Sri Lanka for the first time next month and will keep this in mind!